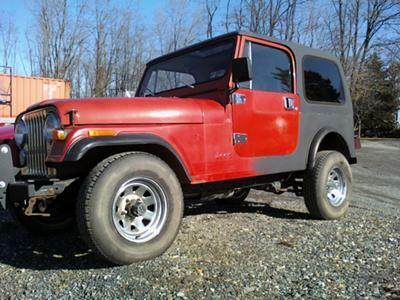 I bought my '84 CJ-7 when I was only 12 years old with the money I earned from working at my dad's shop. It was in fair shape, with some rust and the engine needing a little work. It wasn't that great to look at. It looked very "nancy-boy" with the white wall street tires. First, I fixed the engine; a little carburetor work. Then I briefly fixed the rust in the back, knowing I would come back later when it was time for paint. Power steering made a huge improvement. This made it more fun to take through some of the trails on our property. I still can't believe it went through the creek with the street tires on. You could tell the rocks were slippery. After over a year and a half I finally committed to a four inch lift kit. It was hard to get into when I was only 5 foot tall. Then 3 months later I saved up enough money to get some new rims and 35" tires. And did that ever change the whole appearance of the vehicle? I finally got to take it through some mud! About two months later came the Safari Rack and now it barely fits in the garage. Hopefully a soft top will be ordered soon, then I can start working on the inside. And eventually I plan to install rock sliders, corner guards, new fender flares, and then paint it. Hopefully I will have it done by the time I start driving, which is less than 2 years away. Larry's Comment: Luke...I know how you feel. I got my first car before I was old enough to have a license...and I started fixing it up while waiting until I could legally drive it. The only thing was that my first car was just that...a car...and not a Jeep! By the way...nice CJ-7 you have there. Great to see you have already launched your Jeep interest. Took me until I was 25 and had wasted years on vehicles that were just cars.